The meet is open to middle schools located in Oakland County. Schools must follow MHSAA guidelines. It is held every year on the Thursday before the high school state track meet. In 1979 the Troy Invitational was started. The invitational began by Mark Andrus had many teams from Oakland County and also from other area schools out of Oakland County. The Troy Invitational continued until 1984. With Mark starting a family and no one else able to step in, the Troy Invitational was not held in 1985. In 1986, Nelson Maylone (Abbott - retired) with the help of Mike Stevenson (Highland -retired), Larry Hann (formerly Abbot now Baker), and Mary Lou Hurych (Orchard Lake) put on what can be called the first Oakland County Meet. The first meet held at West Bloomfield High School had 24 girls teams and 21 boys teams. West Bloomfield hosted again in 1987. 1988 saw a similar tale to 1985 with Nelson unable to direct the meet for a third year due to master's classes. This time Mary Lou Hurych picked up the torch and directed the meet in 1989. In 1990 and 1991 we do not know what occurred. Some thoughts are the meet was not held. Others think that is when the meet was first held at Clarkston. What we do know for sure is the meet was held in 1992 at Clarkston and directed by Gordie Richardson. The meet has been held at Clarkston since 1992 under the direction of Gordie Richardson until his retirement after the 2005 meet. Since then, you can find him down on the field as a meet official. The meet has undergone many changes. Since 1992 events have been added or removed from the meet due to changes to the regulations for middle school by the Michigan High School Athletic Association. In 2007 the scoring was changed to eight places to better reflect the growing number of teams. In order to finish a meet of this size in one afternoon and evening, prelims used to be held simultaneously on both sides of the track. As a spectator it was something to watch. As an athlete it could be quite grueling. As a meet worker it was nerve racking. Fully Automatic Timing (F.A.T.) was introduced in 2008 speeding up the meet and making those nail biter finishes easier to judge. This in turn made it possible to have prelims occur one at a time. 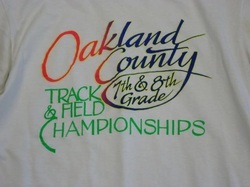 These and other changes have helped to put the Oakland County Track Meet as the preeminent meet in the nation for middle school athletes. It is hard to imagine 16 events featuring over 40 schools and more than 1,000 athletes can be completed in about 6 1/2 hours.